10 red dice with 6's on top also in a triangle, making a square! Adding up gives a total of 84 - check that! How did you count! ? 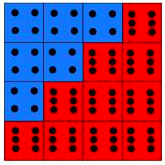 There's a rule for how these are set up- the blue dice have to have the same numbers on the top and the red dice have to use a different number to the blue, but the same on each. What other totals can you make? How many different arrangements can be made? 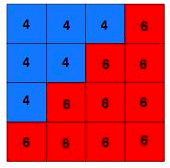 What if the two triangles (that together make up the square) were a different size giving a total of 9, 25, 36 . . . . . dice?